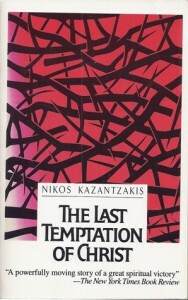 I remember going to see the Willem Defoe version of Kazantzakis' novel when it first came out. I have never quite understood why a certain strain of Christian condemns this book. In the end, the author affirms Christ's divinity and messianic mission. I'm not a Christian myself (though raised Catholic and wanted to be a priest when I was 8 :-) but I enjoyed this book, and found it an intelligent consideration of what it means to be both God and Man.